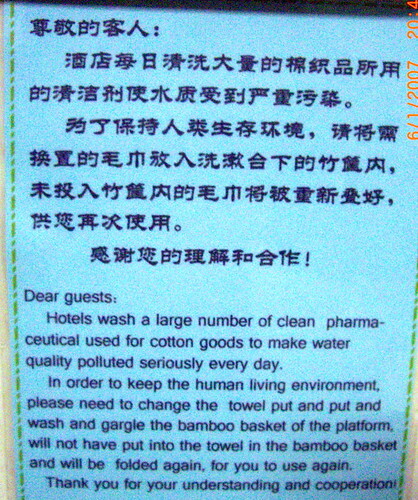 Speaking of stupid translation, here's another that I took in the bathroom of my hotel room in JiangXi. This one read already confirm head explode one. thanks to you...now i got tummyache... lol..
Sunflower & Aloe: Yah lor! Read until head explode right? Pam: I feel your pain, girl. I really do. they copy from chinese to english sia.. lol..
Gary & HiaoAunty: If they are making such a big mess over the translation, they are actually better NOT doing it at all. what the hell is "put and put and wash and gargle"? and "keep the human environment"
I wonder how you can tahan all these man. hahaha..
Ollie: You ask me? I ask who? Jaslyn: I bet somewhere near the floor will have a sign warning you that you may slip, fall and die after reading the sign above. i only understand the last line.. thank you for your understanding and co-operation..